Season pork chops with salt and pepper. 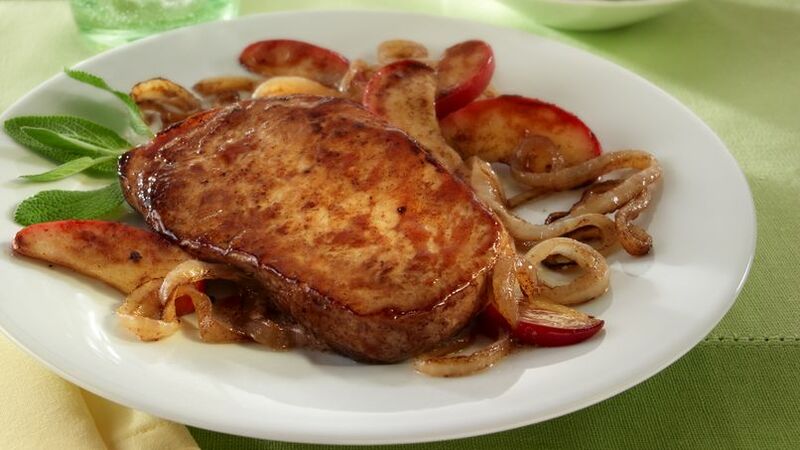 Melt Cinnamon Sugar Butter Spread in 12-inch skillet until sizzling; add pork chops. Cook over medium heat, turning once, until browned (6 to 8 minutes). Remove chops to serving platter; keep warm. Place apple and onion slices into same skillet with pan juices. Cook over medium heat, stirring occasionally, until onions are caramelized (5 to 7 minutes). Stir in garlic; continue cooking until garlic is softened (2 to 3 minutes). Return chops to pan; continue cooking until pork reaches at least 160°F. and is no longer pink (2 to 3 minutes). Serve this aromatic pork dish with a salad or your favorite vegetables.